"Besse-Ashworth Co. Bangor Carnival Parade Float, June 18, 1912"
"Drawn by six beautiful horses the large float of the Besse-Ashworth Co. attracted well deserved attention. It was one of the best floats in the entire parade. On a large platform a Venetian gondola was placed, and beneath a canopy sat four very pretty young women. The gondolier, attired in the correct costume, and standing at his oar, gave the finishing touch and when this float passed through the streets, it was accorded merited applause. The color scheme was blue and yellow, hundreds of large yellow chrysanthemums having been used in gaining an effect that was not surpassed in the whole parade." The Besse-Ashworth Co. were "outfitters of men, women ... and children" (according to 1912 Bangor city directory). Located at 27 Main Street, owners wer Lyman W. Besse, Charles E. Rolfe, and Arthur Ashworth. Besse-Ashworth appears to have been a chain store. Lyman W. Besse's home address in the city directory is listed as Springfield, Massachusetts. 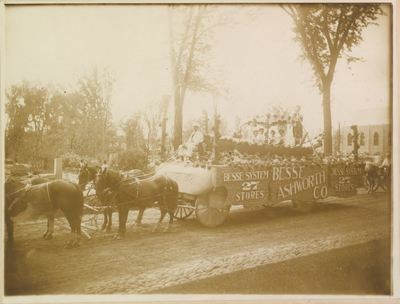 Bangor Carnival 1912, Bangor Maine history, Besse-Ashworth Co.